Toronto & New York, June 7, 2016 — Bond Brand Loyalty, North America’s leading brand loyalty agency, today released its sixth annual consumer loyalty report. The 2016 Bond Loyalty Report reveals that 81 percent of consumers are more likely to continue doing business with brands that offer loyalty programs. Despite this, the report finds that many programs are missing the opportunity to personalize offers and communications. Only 22 percent of respondents are very satisfied with the level of personalization they’re getting from brands, yet, satisfaction is eight times higher when programs are highly personalized. When it comes to customer experience only 20 percent strongly agree that a brand or program representative makes them feel special and only a quarter of respondents feel that the program experience is consistent across varied touch points (such as online, by email, by phone and in person). 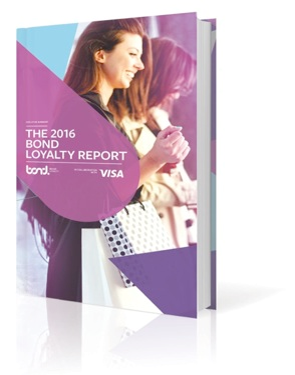 The 2016 Bond Loyalty Report, conducted in collaboration with Visa, is the largest study of its kind. The report captures responses from roughly 12,000 U.S. and 7,000 Canadian consumers. The report covers 58 dimensions of loyalty program performance including program mechanics, communications, rewards, needs fulfillment, loyalty emotional and behavioral outcomes, and brand alignment. Year-over-year program satisfaction is steady at 44 percent even as loyalty solutions continue to innovate, indicating that member expectations are increasing just as quickly as programs are evolving. Developing meaningful loyalty programs that meet customers’ needs while deepening their relationship with brands is a difficult challenge, but when designed and operated effectively can reduce program costs and strongly influence consumer behavior. Consumers belong to an average of 13.4 loyalty programs, but are active in only 6.7 programs. The number of consumers who say they modify the brands/companies they purchase from in order to maximize points continues to increase (67 percent, up from 64 percent in 2015 and 55 percent in 2014). 73 percent of members are more likely to recommend brands with good loyalty programs, which equates to a boost in member acquisition and reduced marketing spend. Top programs that members are very likely to recommend include Sally Beauty Club, My Sheetz, Amazon Prime, and Giant Eagle fuelperks!. 66 percent of consumers modify amounts spent to maximize points. Program satisfaction holds steady from last year—less than half (44 percent) of program members are very satisfied with their loyalty programs, which points to a need for continued focus on program enhancements and improvements to keep up with consumer expectations. 39 percent of members feel that their program fits very well with what they expect from a brand. Top ranked brand-aligned programs include Carter’s Rewarding Moments, Amazon Prime, Kroger Fuel Points, and Nordstrom Rewards. The rewards and redemption experience is key to member satisfaction, yet more than a fifth of members have never made a redemption. Rewards play an important role in retention, as non-redeemers are 2.3 times more likely to defect than recent redeemers, suggesting brands would be well served to focus on the redemption experience, not (just) the reward itself. Credit card loyalty programs can benefit by offering instant retail and online points redemption both to lower the cost per point but also to improve the program experience, as 70 percent of consumers find this redemption option appealing, and 43 percent are willing to pay a points premium for this convenience. 68 percent of female vs. 60 percent of male members are interested in earning rewards for non-purchase activities (updates to profile, refer-a-friend, social activity, etc.). Millennials are 2.2 times more willing than boomers to pay a premium for products and services if they can also earn loyalty and reward points. Six out of 10 millennials are comfortable receiving product recommendations based on their purchase history, compared to only 4 out of 10 boomers. Substantially more millennials value programs that offer special services like concierge (59 percent of millennials vs. 38 percent of boomers). Demand increases to 57 percent of members who want to engage with programs on a mobile device. 62 percent of women vs. 52 percent of men would like to engage with programs on a mobile device. Nearly 50 percent of program members don’t know if there is a mobile app to compliment their loyalty program. Outside of a program app, consumers are most interested in using their mobile device to check their points balances (57 percent), redeem reward points (55 percent), find a location/store (54 percent), and browse reward options (54 percent). The 2016 Bond Loyalty Report performs in-depth profiling of more than 280 loyalty programs across key sectors including payment, retail, hospitality, airlines, gas, dining, CPG, coalition, and others. Some of the top loyalty programs based on overall member satisfaction include Southwest Rapid Rewards, Carter’s Rewarding Moments, Giant Eagle fuelperks!, Kohl’s Yes 2 You, Pampers Rewards, Barnes & Noble Member, Amazon Prime and Chick-Fil-A The A-List. The study also looked at a number of informal loyalty brands—these are brands without a formal loyalty program, but who engage in many similar mechanics to keep their customers happy and loyal. The study provides insights into what these brands are doing well, and how these learnings can be applied to formal loyalty programs. Top informal programs ranked on member satisfaction include Dollar Shave Club, Netflix and Apple Genius. For more information about purchasing the complete 2016 Bond Loyalty Report and to download a free copy of the Executive Summary, visit http://info.bondbrandloyalty.com/2016-loyalty-report. Click here to download the 2016 Bond Loyalty Report infographic. Bond Brand Loyalty is a management-owned agency that specializes in building brand loyalty for North America's most influential and valuable brands. Bond Brand Loyalty’s mission is to make marketing more rewarding for customers, richer and more resilient for brands, and more profitable for our clients. We build measurable, authentic and long-lasting relationships through a combination of services that includes loyalty solutions, customer experience, marketing research, customer analytics, live brand experiences, and proprietary loyalty technology platforms. Visit our website, follow us on Twitter or contact us at 1-844-277-2663.